From Fullerton, the Darden Sisters Band is comprised of Selah, on the violin; Clarah, the lead guitarist; Havilah on mandolin and Tabithah, the bassist. All four girls are vocalists in the group, focusing on harmonies and musical blends. Raised in a family of musicians, the sisters grew up surrounded by musical influences from many music genres, including country, blues, gospel and jazz. In the early 2000's, their family embarked on several tours around the U.S., singing together. Since their days on the road with their family, these singer/songwriter/musicians have developed their own sound, which has been dubbed “Alternative Americana”. The Darden Sister Band will be joined by their grandfather, Joe Tatar, who’s style of performing is a throwback to another era. ..a time when performers were “showmen”. This showman’s entertains his audience with great enthusiasm, boldness and a shear love of music. He provides a theatrical presentation of a variety of music from different genres encompassing his knowledge of music from the 1920’s to 1970’s. Sean Oliu, a 15 year-old singer, songwriter, musician from Anaheim, California. 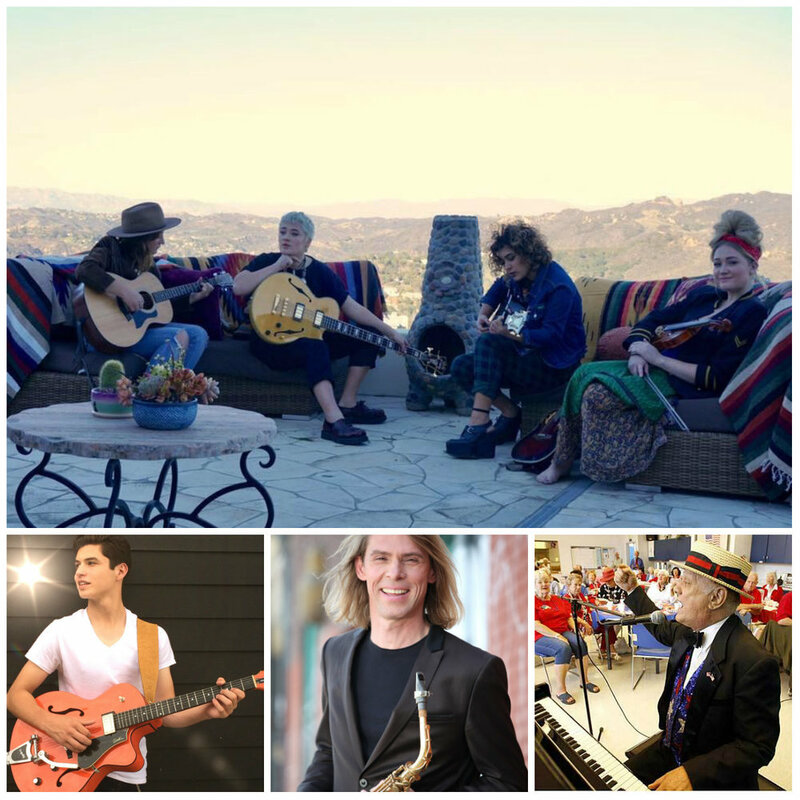 Sean was recently named 2017 “OC Whiz Kid” by the OC Family Magazine and he has now joined the cast of “Club Mickey Mouse”… and Alto Saxophonist, Reinhold Schwarzwald, who brings a unique perspective to jazz by combining his European influences and experiences with the American language of jazz. He has been featured on international and US radio, as well as played at venues such as Montreaux Jazz Festival, Europa Jazz Festival LeMans, House of Blues and LACMA Summer Jazz Series. One of the highlights of Reinhold’s career was opening for the legendary, Ray Charles.